A large number of international programs and agencies are involved in efforts to promote global public health. Among their goals are developing infrastructure in health care, public sanitation, and public health capacity; monitoring infectious disease occurrences around the world; coordinating communications between national public health agencies in various countries; and coordinating international responses to major health crises. In large part, these international efforts are necessary because disease-causing microorganisms know no national boundaries. International public health issues are coordinated by the World Health Organization (WHO), an agency of the United Nations. Of its roughly $4 billion budget for 2015–16, about $1 billion was funded by member states and the remaining $3 billion by voluntary contributions. In addition to monitoring and reporting on infectious disease, WHO also develops and implements strategies for their control and prevention. WHO has had a number of successful international public health campaigns. For example, its vaccination program against smallpox, begun in the mid-1960s, resulted in the global eradication of the disease by 1980. WHO continues to be involved in infectious disease control, primarily in the developing world, with programs targeting malaria, HIV/AIDS, and tuberculosis, among others. It also runs programs to reduce illness and mortality that occur as a result of violence, accidents, lifestyle-associated illnesses such as diabetes, and poor health-care infrastructure. WHO maintains a global alert and response system that coordinates information from member nations. In the event of a public health emergency or epidemic, it provides logistical support and coordinates international response to the emergency. The United States contributes to this effort through the CDC. The CDC carries out international monitoring and public health efforts, mainly in the service of protecting US public health in an increasingly connected world. Similarly, the European Union maintains a Health Security Committee that monitors disease outbreaks within its member countries and internationally, coordinating with WHO. Name the organizations that participate in international public health monitoring. Both WHO and some national public health agencies such as the CDC monitor and prepare for emerging infectious diseases. An emerging infectious disease is either new to the human population or has shown an increase in prevalence in the previous twenty years. Whether the disease is new or conditions have changed to cause an increase in frequency, its status as emerging implies the need to apply resources to understand and control its growing impact. Figure 1. Click for a larger image. Even before the Ebola epidemic of 2014–15, Ebola was considered an emerging disease because of several smaller outbreaks between the mid-1990s and 2000s. Emerging diseases may change their frequency gradually over time, or they may experience sudden epidemic growth. The importance of vigilance was made clear during the Ebola hemorrhagic fever epidemic in western Africa through 2014–2015. 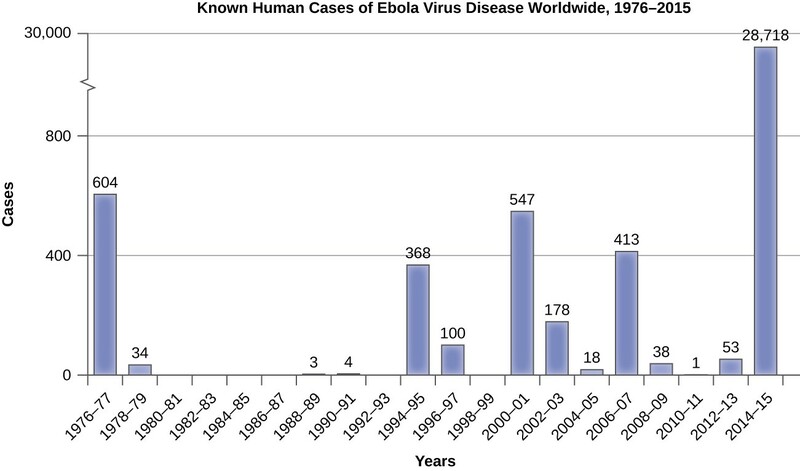 Although health experts had been aware of the Ebola virus since the 1970s, an outbreak on such a large scale had never happened before (Figure 1). Previous human epidemics had been small, isolated, and contained. Indeed, the gorilla and chimpanzee populations of western Africa had suffered far worse from Ebola than the human population. The pattern of small isolated human epidemics changed in 2014. Its high transmission rate, coupled with cultural practices for treatment of the dead and perhaps its emergence in an urban setting, caused the disease to spread rapidly, and thousands of people died. The international public health community responded with a large emergency effort to treat patients and contain the epidemic. Emerging diseases are found in all countries, both developed and developing (Table 1). Some nations are better equipped to deal with them. National and international public health agencies watch for epidemics like the Ebola outbreak in developing countries because those countries rarely have the health-care infrastructure and expertise to deal with large outbreaks effectively. Even with the support of international agencies, the systems in western Africa struggled to identify and care for the sick and control spread. In addition to the altruistic goal of saving lives and assisting nations lacking in resources, the global nature of transportation means that an outbreak anywhere can spread quickly to every corner of the planet. Managing an epidemic in one location—its source—is far easier than fighting it on many fronts. Ebola is not the only disease that needs to be monitored in the global environment. In 2015, WHO set priorities on several emerging diseases that had a high probability of causing epidemics and that were poorly understood (and thus urgently required research and development efforts). A reemerging infectious disease is a disease that is increasing in frequency after a previous period of decline. Its reemergence may be a result of changing conditions or old prevention regimes that are no longer working. Examples of such diseases are drug-resistant forms of tuberculosis, bacterial pneumonia, and malaria. Drug-resistant strains of the bacteria causing gonorrhea and syphilis are also becoming more widespread, raising concerns of untreatable infections. Explain why it is important to monitor emerging infectious diseases. Explain how a bacterial disease could reemerge, even if it had previously been successfully treated and controlled. 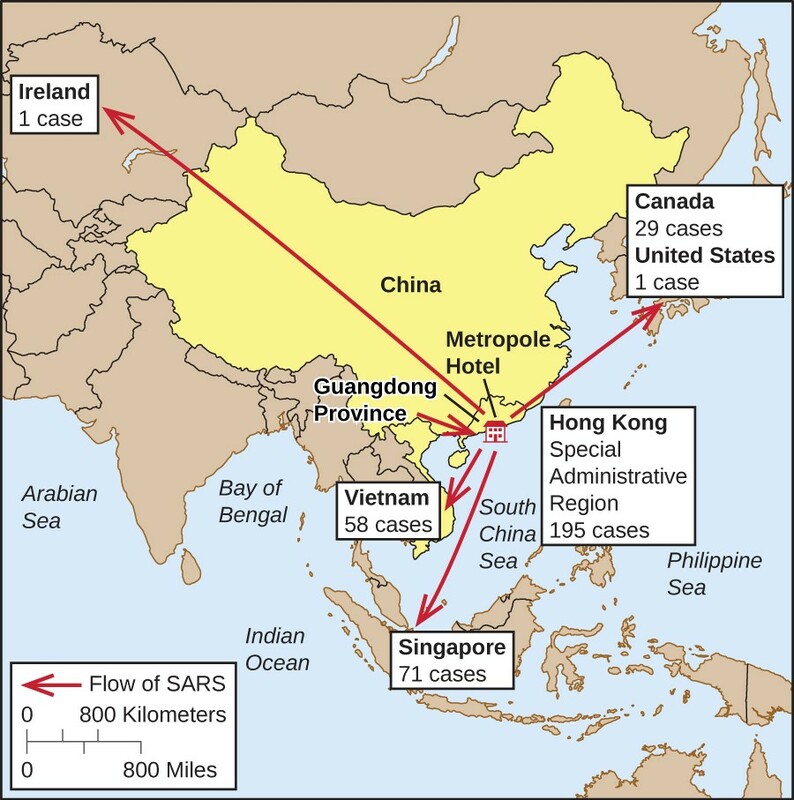 On November 16, 2002, the first case of a SARS outbreak was reported in Guangdong Province, China. The patient exhibited influenza-like symptoms such as fever, cough, myalgia, sore throat, and shortness of breath. As the number of cases grew, the Chinese government was reluctant to openly communicate information about the epidemic with the World Health Organization (WHO) and the international community. The slow reaction of Chinese public health officials to this new disease contributed to the spread of the epidemic within and later outside China. In April 2003, the Chinese government finally responded with a huge public health effort involving quarantines, medical checkpoints, and massive cleaning projects. Over 18,000 people were quarantined in Beijing alone. Large funding initiatives were created to improve health-care facilities, and dedicated outbreak teams were created to coordinate the response. By August 16, 2003, the last SARS patients were released from a hospital in Beijing nine months after the first case was reported in China. In the meantime, SARS spread to other countries on its way to becoming a global pandemic. Though the infectious agent had yet to be identified, it was thought to be an influenza virus. The disease was named SARS, an acronym for severe acute respiratory syndrome, until the etiologic agent could be identified. Travel restrictions to Southeast Asia were enforced by many countries. By the end of the outbreak, there were 8,098 cases and 774 deaths worldwide. China and Hong Kong were hit hardest by the epidemic, but Taiwan, Singapore, and Toronto, Canada, also saw significant numbers of cases (Figure 2). Fortunately, timely public health responses in many countries effectively suppressed the outbreak and led to its eventual containment. For example, the disease was introduced to Canada in February 2003 by an infected traveler from Hong Kong, who died shortly after being hospitalized. By the end of March, hospital isolation and home quarantine procedures were in place in the Toronto area, stringent anti-infection protocols were introduced in hospitals, and the media were actively reporting on the disease. Public health officials tracked down contacts of infected individuals and quarantined them. A total of 25,000 individuals were quarantined in the city. Thanks to the vigorous response of the Canadian public health community, SARS was brought under control in Toronto by June, a mere four months after it was introduced. In 2003, WHO established a collaborative effort to identify the causative agent of SARS, which has now been identified as a coronavirus that was associated with horseshoe bats. The genome of the SARS virus was sequenced and published by researchers at the CDC and in Canada in May 2003, and in the same month researchers in the Netherlands confirmed the etiology of the disease by fulfilling Koch’s postulates for the SARS coronavirus. The last known case of SARS worldwide was reported in 2004. This database of reports chronicles outbreaks of infectious disease around the world. It was on this system that the first information about the SARS outbreak in China emerged. The CDC publishes Emerging Infectious Diseases, a monthly journal available online. The World Health Organization (WHO) is an agency of the United Nations that collects and analyzes data on disease occurrence from member nations. WHO also coordinates public health programs and responses to international health emergencies. Emerging diseases are those that are new to human populations or that have been increasing in the past two decades. Reemerging diseases are those that are making a resurgence in susceptible populations after previously having been controlled in some geographic areas. Which of the following would NOT be considered an emerging disease? Answer d. Tuberculosis would not be considered an emerging disease. Which of the following would NOT be considered a reemerging disease? Answer d. West Nile virus fever/encephalitis would not be considered a reemerging disease. Which of the following factors can lead to reemergence of a disease? Answer b. A period of decline in vaccination rates can lead to reemergence of a disease. Why are emerging diseases with very few cases the focus of intense scrutiny? Answer b. They are increasing and therefore not controlled. The ________ collects data and conducts epidemiologic studies at the global level. The WHO (World Health Organization) collects data and conducts epidemiologic studies at the global level. An Atlantic crossing by boat from England to New England took 60–80 days in the 18th century. In the late 19th century the voyage took less than a week. How do you think these time differences for travel might have impacted the spread of infectious diseases from Europe to the Americas, or vice versa?